Don't. Traditional organizations should avoid the extra strain, trouble, and expense of remote members without a significant reason. For example, building a better team using remote rockstars might provide some justification, but you might also be better off with a capable, local team that works well together. It's often out of your control, though, and in the hands of a really big boss, bean counter, or entrenched culture. You can make it work: Virtual organizations, startups, and the like find great success using virtual tools, pairing, and non-traditional communication pathways. Make sure you really mean it, because it's not a trouble-free add-on to the way your large organization does things now. Don't treat remotes as if they were local. Treat your "satellite" developers as competent people with physical limitations. A remote is visually impaired, since he can only see through a web cam, and only when it is on. He cannot see the kanban board, the other side of the camera, and so on. Likewise, he only hears what is said into the microphone and not at all if simultaneous conversations occur. A remote cannot cross the room and talk to people, so interoffice chat (Skype, Jabber, etc) is essential. The local team has to make concessions, repeat conversations, and be the eyes and ears of the remote employees. Do not treat unequal things as equal--accept that there are compromises. 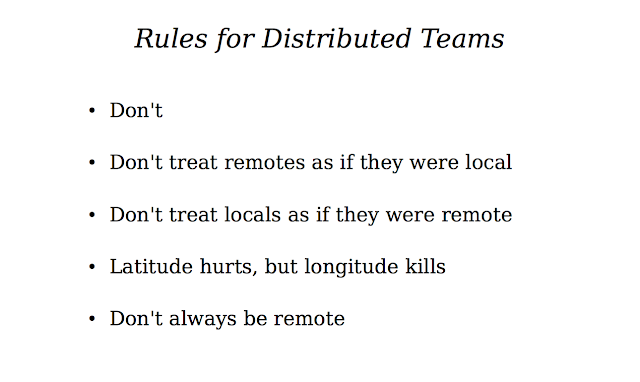 Don't treat locals as if they were remote. You certainly can install electronic kanban boards, online agile project management tools, instant messaging, cameras, email, and shared document management so that every local can sit alone in a cubicle or office and behave just like a remote employee. Rather than being empowered, you are all equally limited (see point #2). Never limit so that all are equal. Allow all to rise to greatness. The power of people working closely together in teams is significant (see first bullet above). Latitude hurts, but longitude kills. Just being remote hurts (see first two bullets), but the complications can be overcome when employees share the same time zone and working hours. The further you move the team across time zones, the fewer common hours they have, and the longer any kind of communication takes to make a round-trip. Agile is predicated on short feedback loops, so 24-hour turn-around is out of the question. If you can't be a single team that works together, create separate agile teams. Don't always be remote. Begin your engagement with a nice long on-site visit. A week is barely enough. Two weeks starts to make it work. Visiting for one week a quarter or even a week a month can keep a feeling of partnership alive. Dealing with difficulties is easy among people who know and respect each other. While constant telepresence (Skype, Twitter, IM, etc.) can minimize the problem of "out-of-sight, out of mind," studies show that distributed team success requires teams with strong interpersonal relationships, built best on face-to-face interaction. The bean counters may not be able to comprehend it, but the investment is well worth the return. Tim: Would I remote again? In fact, I do most of my Industrial Logic work remote. We are in constant touch with each other and pair frequently. I converse with Joshua Kerievsky more in the course of a week than I have any other "boss" (he'll hate that I used that word!) in my employment history. We even work across time zones. We would work more fluently and frequently side-by-side, but we'd probably not get to work together if we all had to relocate. It is a compromise that has surprisingly good return on investment for us. We also have the advantage that we are all mature agilists; it would be very hard for first-timers. It's hard for me, as I have a tendency to "go dark" sometimes. Jeff: I enjoyed a year of remote development with a now-defunct company one time zone to the east. Pairing saved it for me. The ability to program daily in (virtually) close quarters with another sharp someone on the team helped me keep an essential connection with them. On the flip side, however, I never felt like I was a true part of that team. I missed out on key conversations away from the camera, and I felt that debating things over the phone was intensely ineffective. You do what you must, but I'd prefer to not be remote again. On 2 diff teams, one in which I was the remote person, the other in which we have a teammate in India, we found the use of a virtual telepresence device to be transforming. If I work remotely now, I get on the telepresence laptop, it's on a rolling cart, microphone picks up even casual conversations in the team room, and I can control the camera. I can talk to teammates as if I were in the room, see the whiteboard, almost as good as being there. For some reason, video makes a huge difference. I love using a netbook as a telepresence device, because it provides a physical object representing you, is very inexpensive, and offloads the audio/visual processing to a separate computer (important especially if you use windows). Has anyone tried a tablet for telepresence? An inexpensive android tablet that can run skype might be handy (need a kickstand or picture frame holder).